Mostly forgotten today Muriel King, an illustrator turned designer, was on the rise during the 1930s. She was born in 1900 in Bayview, Washington. While attending university as an art student, she designed theater costumes. She later moved to New York City where, at the beginning of the 1920s, she worked as a fashion illustrator for magazines such as Vogue and Harper’s Bazaar for the leading department store Bonwit-Teller. She entered the world of fashion design in 1932 when she opened her couture salon on East 61st street. That same year she was chosen by Lord & Taylor to design an exclusive ready-to-wear line. The following year B. Altman sold an entire collection ranging from evening gowns, bathing suits and even skating outfits, all designed by King herself. It was her background as artist and illustrator that informed her sense of color and shape. Her designs were fluid and streamlined. King had a modern sensibility that emphasized clean lines and long-lasting elegant simplicity. Her ability to identify a change in the taste and the needs of young American women helped her not only to survive the Great Depression, but also to become a great success at a time when most other houses had to close down. 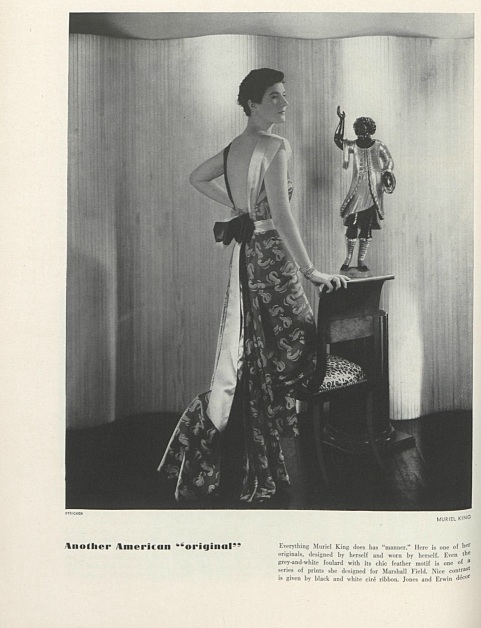 King was not the only designer during the 1930s to promote the “day-into-evening” dressing, but she certainly was one of the most successful at it. She designed her dresses clean of any unnecessary trimmings and embellishments, and with the aim that the client will be able to use it for at least five years without appearing dated or unfashionable. The accessories she created to go with them transformed the dresses and updated them from season to season. Dress designed by Muriel King. Vogue, July 15, 1932. 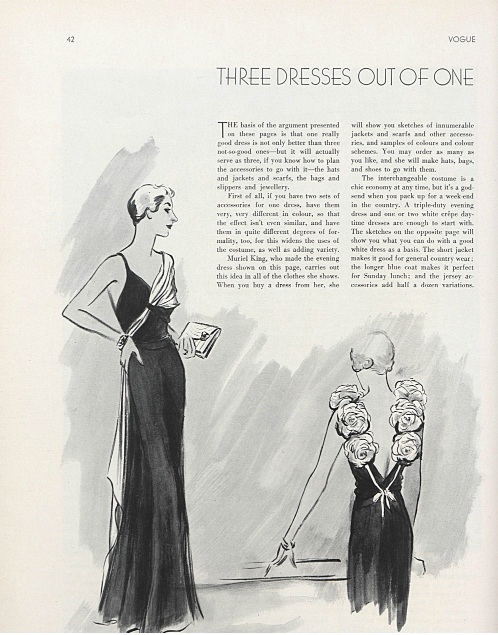 Muriel King who made the evening dress shown on this page, carries out this idea in all the clothes she shows. When you buy a dress from she will show you sketches of innumerable jackets and scarfs and other accessories, and samples of colours and colour schemes. You may order as many as you like, and she will make hats, bags, and shoes to go with them. King lacked formal training in fashion design, which is quite surprising when studying her exquisitely crafted garments. Instead of draping or cutting like some designers, King beautifully illustrated in watercolor, the designs were then interpreted by her team into pattern and cut. 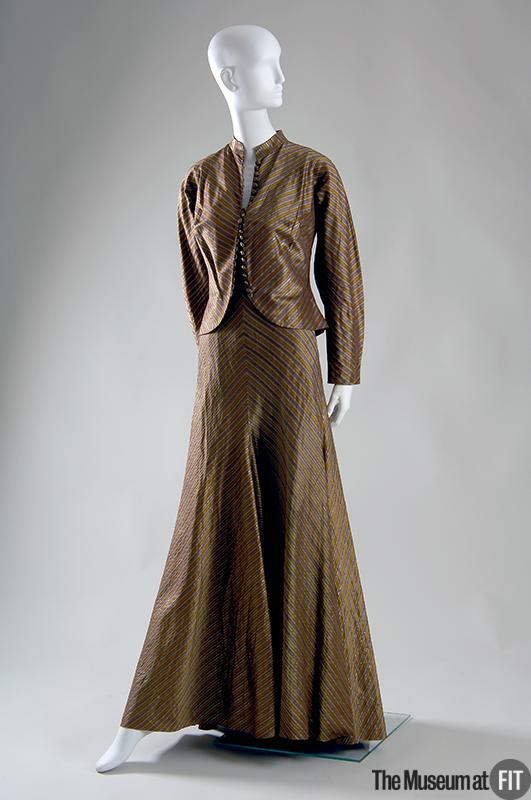 According to the Museum at FIT this jacket and skirt are “made from a simple striped fabric that King had cut and reassembled at a 45 degree angle. This technique, known as “mitering,” was popular with leading couturiers. This and other examples that exist at the Museum at FIT are complex in construction and are masterfully executed, despite the fact that King did not have formal knowledge in pattern making or that she did not drape or sew. In 2009 the graduate students of this program, in collaboration with the Museum at FIT, curated the first exhibition to solely focus on King’s work and life. The exhibition featured garments from the museum’s permanent collection along side King’s beautiful illustrations which are housed the Gladys Marcus Library’s Special Collections and FIT Archives. A similar design to that worn by Lucile Ball on the cover of the brochure of the exhibition Muriel King: Artist of Fashion. Ilustration by Muriel King from Muriel King Archive, Special Collections, Gladys Marcus Library at FIT. In the 1940s King left New York and moved to Hollywood where she created costumes for film. Until her retirement in the 1950s she continued to design lines for various department stores. The last two decades of her life were dedicated to painting, although she became famous as a fashion designer she always saw herself as an artist. i recently acquired four costume sketches said to be by King – they are unsigned. i wonder if you, George Pitropakis, would be interested in comparing these to your watercolor for “similarity” or not of hand. I believe that it will be difficult to compare as the watercolor displays a greek landscape which is very different in style from your fashion sketches. I believe that it will be more convincing if you compare with other costume sketches. I would advise you to check also on Flickr.com as they are a few there. If you think that I can help please feel free to send me screenshots though. your points are good good ones, G.
if you send me a direct email address i can send you a snap of my sketches, if that’s agreeable. I would be delighted seeing your sketches. And when I have your own email I will send you snapshots of my Watercolor and two other very nice drawings that Muriel King did. They both show trees. Again the thechnique she used there is completely different from the watercolor and the fashion sketches. I will be on vacation during the next two weeks so please forgive me for now replying directly. Mr Pitropakis, you are lucky indeed to have a landscape done by Muriel ! She was our neighbor for many years and my mother was her friend. Isn’t strange that no biographies of Muriel mention that she worked in Greece after the war in collaboration with the Marshal Plan to develop the textile industry there ? That is why she painted and drew many mediterranean landscapes and trees. She was indeed an excellent artist ! What a wonderful surprise reading your message. I had posted mine like throwing a bottle in the sea…I had never hoped for someone knowing her that good would see it, let alone reply it. I had indeed no Idea Mrs King travelled in Greece because she had that mission related to the Marshal Plan. The watercolour I have shows a landscape of the Island Rhodes in Greece, where I am from, even though I now live in Belgium. I have searched the Internet to learn more about her life but until now I have not been very successful. A close friend’s wife, an university teacher is preparing a book about Cinema and fashion. I told her about Muriel King. I hope that I convinced her about how interesting that great Lady was and that she will at least give her a chapter of the book. Rosemary, if you do not mind, feel free to drop me an email, I would like to share pictures of drawings I have with you. So many thanks for you reply. How lucky am I. I met Ms. King in 1977, while she was ill. My best friend gave her a dinner party one evening, and I was fortunate to decorate the dining table. Muriel loved sea shells,so I lined the long dining table down the center with sand, moss, and lots of white and cream sea shells. Lots of white orchids just added the delicate touch to the hard lines of the shells. When Ms. King arrived she almost cried with happiness. Of course I was beaming. As she was suffering with her cancer, we added pillows to her back at the dining table so she could be more comfortable. Even though she was ill, she arrived in a white tucked long dress from Mexico, and wore a white turban, so chic a Lady! What an incredible evening. She never complained about herself, and even danced several ‘slow’ dances with me. A memory I will never forget! Now I’m the lucky person to have several of her drawings in my art collection. Still the memories build. Never forget the wonderful talented people we are fortunate to meet along the way! I wonder, Mr. Reeves, if you know enough about Muriel King’s sketches to look at 4 in my possession that are said to be her work from the late 30s, specifically in regard to designing the women’s costumes for George Balanchine’s first American staging of his ballet APOLLON. I don’t now if it’s wise to put one’s personal email in comments like these but if you reply here maybe we can communicate further if such would be of interest to you.